Today we look back to this date in 1979 when Glenn Hoddle crowned his England debut with a memorable goal against Bulgaria at Wembley. The sidefooted effort and all-round performance made him the talk of the nation, but it would also lead to his subsequent England career constantly being compared to it. 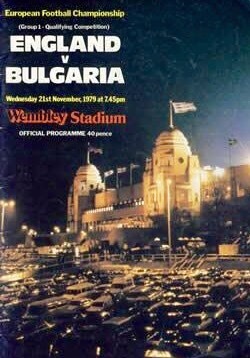 In November 1979 England became certain of qualifying for the following year’s European Championship without playing, as the Republic of Ireland lost to Northern Ireland and the visit of Bulgaria to Wembley was fogged off. The match was postponed 24 hours, as England geared up for a rare Thursday night game. This created problems, for not only was it less than 48 hours before a full programme of First Division matches but England would have to make do without captain Kevin Keegan who returned to club side Hamburg. For their final match of the 1970s England boss Ron Greenwood handed debuts to two players – Norwich City forward Kevin Reeves (who would only win one further cap) and Tottenham Hotspur midfielder Glenn Hoddle. The latter’s call-up came after featuring for England Under-21s and making an impressive start to the season at club level, scoring spectacular televised volleyed goals against Manchester United and European champions Nottingham Forest that underlined the player’s talent. It was time for the step up into the international big time. ‘Naturally gifted’ was a frequently used term to describe Hoddle, who was certainly not the stereotypical English midfielder. He won many admirers for his elegance, creativity and technical ability, but also had to contend with detractors who would rather cruelly label him ‘Glenda’ and see him as a luxury who was not willing to get stuck in. He would forever divide opinion, not least during his reign in charge of England from 1996 to 1999. ‘Enigma’ was a word that would often appear in the same sentence as his name. But even his critics would concede that Hoddle was a talented player and capable of the spectacular. As England took to the field against Bulgaria, Hoddle was entering the world of senior international football and playing at Wembley for the first time. In the commentary box for the BBC was Barry Davies, a man who hid his Spurs loyalties during his long football broadcasting career but never shied away from voicing his admiration for Hoddle. “The most naturally gifted of a crop of youngsters of quality,” Davies said of the debutant as the camera zoomed in on him. Where many players have found the transition to international football difficult over the years, Hoddle showed within minutes he could handle it and he would be an asset to his country. He floated a ball in for Dave Watson to head England – wearing an unusual combination of white shirts, blue shorts and red socks – into an early lead. That wasn’t a bad way to start Hoddle’s international career and he continued to shine as the night progressed, before pulling off his party piece to seal victory on 70 minutes. Glenn Hoddle made an impressive start to his England career. Bulgaria half-cleared a cross and Trevor Francis pulled the ball back to Hoddle, who was just outside the box. He leaned back and nonchalantly sidefooted the ball high into the roof of the net, with the Bulgarian goalkeeper unable to stop it despite getting a touch to the ball. Wembley erupted, celebrating the emergence of a genuinely exciting talent. Davies seized his moment. “Well you won’t believe this but he said to me before the match ‘it could be I’ll get one’,” he told viewers. Such a comment illustrated Hoddle’s self-belief, although others would forever perceive him as arrogant. It was a fine line. Glenn Hoddle sidefoots in his debut goal. This was high praise indeed and in the Daily Express, Joe Melling was also full of enthusiasm about what he had seen. “Hoddle, a 22-year-old self-confident cockney, stopped the show with an opening performance that can rarely have been bettered,” he wrote, under the headline ‘Hoddle’s a Dream’. In the same newspaper, David Miller said Hoddle gave “a mature first appearance as impressive as another London kid called Bobby Moore 17 years ago”, while Alan Thompson commented on it being “one of the most accomplished displays I have ever seen from an England player on debut”. And on it went, Hoddle probably feeling tempted to buy every newspaper the morning after the game as he dominated the back pages so much. But perhaps – in hindsight at least – the extent of the praise wasn’t totally a good thing, as he would now face a weight of expectation to deliver such performances every time he pulled on an England shirt. 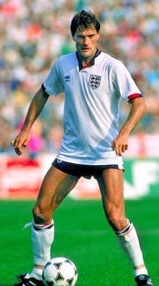 Davies was right that Hoddle would be a star name of the 1980s, but at international level he perhaps never totally fulfilled the promise shown on his debut. In some way the Bulgaria game was a millstone around his neck, in the same way that John Barnes’ wondergoal against Brazil in 1984 became something of a burden for him. For both players, the famous goals they scored raised expectations higher than perhaps they realistically should have been. Both men had flair and creativity, but they would at times cut frustrated figures as people asked why they weren’t producing the same performances at international level as they did for their clubs. The way they were utilised would often be an answer, Hoddle insisting people would not see the best of him when shunted out wide as he paid for England having an abundance of other central midfielders in his era including Bryan Robson, Ray Wilkins and Peter Reid. And the Bulgaria goal just wouldn’t go away. After shining against West Germany in 1985, ITV pundit Jimmy Greaves expressed his view of Hoddle’s performance that it was “probably the best game he’s played for England since his debut”. That was almost six years earlier and it was as if everything he did in an England shirt had to be compared to it – either that he was finally fulfilling the promise shown on his debut, or that he had never replicated such a performance. 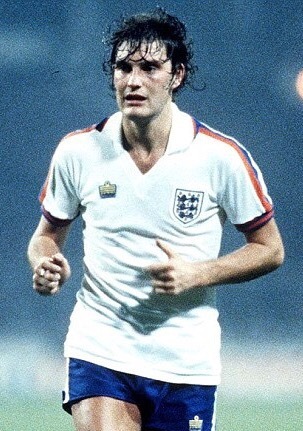 Hoddle’s England career would end in 1988 with 53 caps. Hoddle emerged in the same period as Terry Butcher, Bryan Robson and Kenny Sansom, who like him would remain regular members of the England squad for the next decade or so. But while Hoddle was capped 53 times, Robson (90 caps), Sansom (86) and Butcher (77) would all appear significantly more. Although Hoddle’s appearance tally was no disgrace, there was a feeling it should have been so much more. Under both Greenwood and Bobby Robson, the player remained a prominent member of the squad but was not always in the side. He continued to shine at club level and would score particularly superb goals for Spurs against Watford and Oxford United. If ever an Englishman was likely to thrive on the continent it was him, given his style of play. He slotted in well at Monaco after joining in 1987, but following Euro ’88 he never won another England cap. Michel Platini claimed Hoddle “would have won 150 caps” had he been born French. Hoddle would subsequently manage England, but his controversial beliefs led to his downfall. The beginning of the end was a dire 0-0 draw at home to Bulgaria early in the Euro 2000 qualifying campaign – how Hoddle must have wished he could have fielded his younger self to sidefoot in a delightful goal against the Bulgarians, just as he had done 19 years earlier.